Mr Edhi’s life story is awesome, as I learnt when I spent two weeks working at one of his ambulance centres in Karachi. This was the moment Mr Edhi, finding himself penniless on the streets of Karachi, set out on his life’s mission. At first, Mr Edhi welcomed his duties; then he was appalled to discover that the charity’s compassion was confined to Memons. He would hurtle round the province of Sindh in his poor man’s ambulance, collecting dead bodies, taking them to the police station, waiting for the death certificate and, if the bodies were not claimed, burying them himself. Mr Edhi’s autobiography, published in 1996, records that he recovered these stinking cadavers "from rivers, from inside wells, from road sides, accident sites and hospitals… When families forsook them, and authorities threw them away, I picked them up… Then I bathed and cared for each and every victim of circumstance." Once again, this practice brought him into conflict with religious leaders. They claimed that adopted children could not inherit their parents’ wealth. 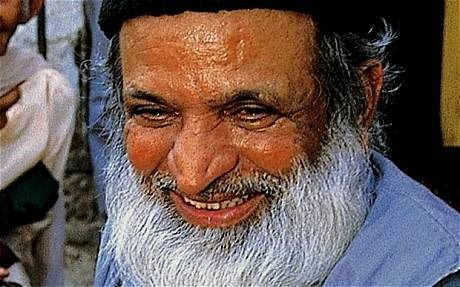 Mr Edhi told them their objections contradicted the supreme idea of religion, declaring: "Beware of those who attribute petty instructions to God." Over time, Mr Edhi came to exercise such a vast moral authority that Pakistan’s corrupt politicians had to pay court. In 1982, General Zia announced the establishment of a shura (advisory council) to determine matters of state according to Islamic principles. Reaching Quetta in northern Baluchistan, with the temperature plunging, he relented enough to allow her to buy a Russian soldier’s overcoat. Later on, when their children grew up, Mr Edhi would not find time to attend his daughter’s marriage. But Mr Edhi’s epic achievement would not have been possible but for this inhuman single-mindedness. Today, the influence of the Edhi Foundation stretches far outside Pakistan and Mr Edhi has led relief missions across the Muslim world, providing aid at every international emergency from the Lebanon civil war in 1983 to the Bangladesh cyclone in 2007. The story of Mr Edhi coincides with the history of the Pakistan state. More than any other living figure, he articulates Jinnah’s vision of a country which, while based on Islam, nevertheless offers a welcome for people of all faiths and sects. Indeed, the life of Mr Edhi provides a sad commentary on the betrayal of Jinnah’s Pakistan by a self-interested political class.